A TeXas Style Introduction to Proof is an IBL textbook designed for a one-semester course on proofs (the “bridge course”) that also introduces TeX as a tool students can use to communicate their work. As befitting “textless” text, the book is, as one reviewer characterized it, “minimal.” Written in an easy-going style, the exposition is just enough to support the activities, and it is clear, concise, and effective. The book is well organized and contains ample carefully selected exercises that are varied, interesting, and probing, without being discouragingly difficult. A lovely little book for beginning mathematics majors and other students encountering proofs for the first time. Students should find the text appealing, and it contains many good exercises that a professor can build a course around. … Overall, a most satisfying book for a beginning class in mathematical proofs. 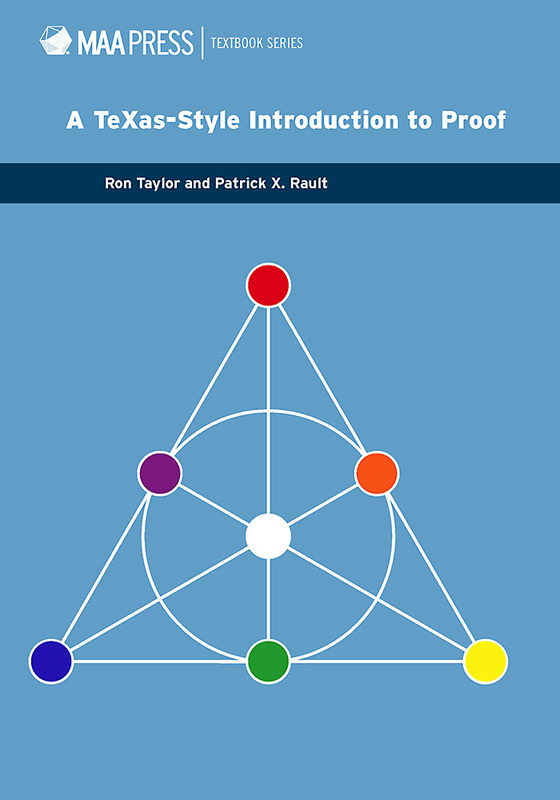 A TeXas Style Introduction to Proof by Ron Taylor and Patrick X. Rault is truly delightful-full of humanizing charm that softens the hard edge of mathematical rigor. It is gentle, lively, clear, and warm. … From this book, students and their instructors will find many proofs of the joy of mathematics. Taylor and Rault skillfully guide students through basic proof-writing techniques so that the student createsand discovers the content. The book is well-written, the integration of LaTeX is unique, and the authors have a fantastic sense of humor.